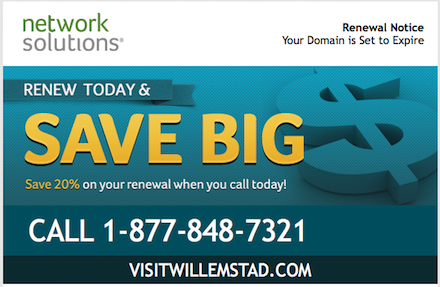 Because I am an active NameJet bidder, I have quite a few domain names at Network Solutions. Because of the pricing deals I am offered elsewhere, I tend to transfer out my domain names before they expire. VisitWillemstad.com is a domain name I won on NameJet. After receiving several expiration notices for this domain name, I transferred it to my Enom account. On August 3, Enom emailed me to confirm that the transfer was successful. A Whois search confirms that this domain name is registered at Enom. How the heck can I renew a domain name at Network Solutions when it already transferred to Enom? Obviously, I can’t do that. Fortunately for me, I have a relatively small domain portfolio and I stay on top of renewals and transfers. Someone else might get confused and try to renew this domain name that was already transferred. I assume Network Solutions would not charge for a renewal on a domain name that is no longer registered there, although it might be frustrating to call and waste time with that. I did not call to see if they would process a renewal, so I can’t say whether or not this would happen. In my opinion, Network Solutions should check to see if a domain name is still registered there before sending this type of email. It can be a bit confusing, especially for a person or company with a large domain name portfolio. Maybe the’re referring to a guy called big, that needs to be saved. I’ve been getting these on domains I’ve already transferred for a very long time. As if Network Solutions hadn’t already made the transfer process itself painful enough (which is truly awful), they confuse the hell out of you with these emails, not to mention some of the domains are still sitting in my account! They did it to me for a long time until I closed the account. Now, I wasn’t nuts having an account with them. to my regular registrar before expiration. The other surprise is Sedo. without being listed for sale on Sedo account..? Annoyng. If you are like me, I was pissed when I learned my name was transferred to NS. I received no new username or password etc. Now I too am getting a renew notice. Not one, several times a week. I wouldn’t spend one nickel with NS. They are a company that has been over- pricing their names and services for decades. They are too big and unorganized. Hence, sending you renewals when you don’t have your name there. It’s horrible, but everybody is sleeping while Verisign may quietly get “Carte Blanche” on .com pricing if we do not react massively and do it now! Read here the .COM Amendment. If the proposed 8-year .COM extension is granted by ICANN, and the Cooperative Agreement expires in 2018 (between VeriSign and NTIA), VeriSign will no longer be subject to price restraints on .COM domains! What will happen if tomorrow the annual renewal cost of .com is multiplicated by 2, 3, … why not 10? People running sites will pay, there is no doubt! But for domain investors like you, or me, it can be a true disaster, just take few seconds to calculate and imagine the nightmare. This is why I urge you to voice your opinion by emailing at comments-com-amendment-30jun16@icann.org before August 12th to stop them. I also ask bloggers to kindly help relay the message, not only is critical for domaining but it’s also urgent. In a more positive note, until the end of the summer it will only cost $10 to feature a domain for sale in domaining.com, so why not test water? What does that have to do with Network Solutions?